At BabySparks we’re all about enhancing your baby’s learning from the minute he’s born. But that isn’t when learning begins. In fact, when he’s born he’s already acquired knowledge about language, food preferences, and emotions. Here are some of the fascinating discoveries from research about what babies learn in the womb. Your baby’s hearing develops around 24 weeks in the womb, and the first sound he learns is your voice. A well-known study made clear that newborns recognize their mother’s voice. Researchers used a rigged pacifier to show that newborns sucked more to hear a recording of their mother’s voice compared to a recording of a stranger’s voice. Experts believe this learning helps your baby bond with you. In the womb your baby not only learns the sound of your voice, he also learns to recognize the language you speak. Newborns can tell the difference between their mothers’ language and foreign ones, and even cry in the accent of their mothers’ native tongue! In a study examining language learning in utero, researchers directed mothers to play a recording containing music and specific made-up words. When the babies were born, they recognized the made-up words—an effect strengthened by the number of times they heard the recording. Other researchers asked a group of mothers to repeat the same nursery rhyme while pregnant, then used fetal heart monitors to discover that fetuses’ heart rates slowed every time the familiar rhyme was recited. Still other research showed that Dutch adults adopted from Korea learned Korean language sounds more easily than Dutch adults born to Dutch parents. When you eat while you’re pregnant, the flavors of your food enter the amniotic fluid your baby swallows. Several studies show that when starting solids, babies prefer flavors they learned in the womb. A mother’s diet during pregnancy can have long-term effects on her baby’s health. Researchers looked at adults who were born after the “Dutch Hunger Winter,” a period of famine during World War II. Those whose mothers were not able to eat enough during the beginning of pregnancy were born with altered genes that made them more susceptible to obesity, diabetes and heart disease. In her 2010 TED Talk, reporter Annie Murphy Paul suggests that this change may reflect the fetus learning that because food is scarce, it needs to hold tight to every calorie it consumes. Remarkably, research examining children born to mothers who witnessed the 9/11 attacks first-hand while pregnant found that the mothers who developed post-traumatic stress disorder (PTSD) gave birth to children wired to be more prone to developing PTSD themselves. This suggests that fetuses may learn from high amounts of maternal stress that the world is not safe, and that they need to be on-guard. Although more research is needed, other studies also suggest links between pregnant mothers’ emotions and their children’s mental health. One study found that pregnant mothers with significant depression gave birth to babies with altered brain structures. If you’re pregnant, this may motivate you to talk to the baby in your belly, or even eat lots of vegetables in hopes that your little one will enjoy them down the road! The important takeaway for us at BabySparks is this: Knowing that babies are capable of learning in the womb makes it clear that they’re ready to continue learning the moment they leave the womb. 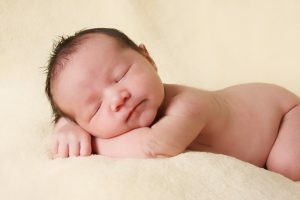 Newborns are often affectionately referred to as “blobs,” but they’re actually primed to absorb lessons from everyone and everything they interact with. That’s why the development-boosting activities in our program start at age zero! For more information about your infant’s rapidly-developing brain (and your role in shaping it), head over to this article.